woods. She told her story to Merima Husejnovic. in a place called Mahala. This is where my tragic experiences began. what I was doing. I was instantly aware of what might happen. the hotel was “Vilina Vlas”. I did not know the place. each other. All the rooms were closed. people did to the women. simply do not know what to do with myself. We stayed in the room until dawn. He kept his gun next to the bed. clothes and took me with him. adding that nobody should touch me. me and kill me and my whole family if I disappeared anywhere. you went out, you could disappear. That is how it was. knocked on the door, my mother used to faint. whichever place suited him best. You had to keep quiet and pray. month he did whatever he wanted to do with me. looking for me and asking people about me. had been rejected by everybody, the whole world. I was still only 22.
generations live, but nothing will be as it once was. due to my fears and to all the things that had stayed in me. crimes. He must accept the gravity of his actions and admit his guilt. group, the “Beli orlovi” (“White Eagles”) or “Osvetnici (“Revengers”). of those detained in the centre survived. committed at various locations in Visegrad, including the Vilina Vlas. Yugoslav army implicated in atrocities against Muslims in eastern Bosnian town. A witness in the Milosevic trial this week accused Yugoslav army, JNA, troops of crossing the border into Bosnia to ethnically cleanse the town of Visegrad in the early phase of the Bosnian war. The claim is potentially hugely significant – prosecutors say Milosevic, then the president of Serbia, had control over Yugoslav security forces. Testifying under a pseudonym B-1505, he said JNA troops came to Visegrad, took control of the eastern Bosnian town and helped expel the Muslim population. JNA troops turned up in Visegrad in mid April 1992, under the command of Colonel Dragoljub Ojdanic, one of Milosevic’s top commanders. B-1505 said he met the colonel in person on two occasions in the town. Once, while waiting for him at army headquarters, he said he overheard five JNA officers planning the ethnic cleansing of local Muslims. One pulled out a map of the town on the table, and said that the right bank of the Drina river was “clear”. “And tomorrow, we will cleanse this part,” the witness claimed the officer said. B-1505 said the colonel took him to a place where 3,000 to 4,000 people had taken refuge. The witness insisted that the JNA protect them. Ojdanic then ordered one of his subordinates to arrange for them to be brought into the town. The next day, thousands of civilians were escorted to Visegrad’s football pitch. When they arrived, they were split into four groups and searched before being allowed to leave. They could not go home, however. A JNA officer, which the witness could identify only as Colonel Jovanovic, told them that they would only be able to go to the villages that were under his control. He said that outside this area there were Serb paramilitary units, the White Eagles, roaming around and they would kill Muslims on sight. Then came apparent confirmation of links between the Bosnian Serbs and Yugoslav army. While waiting to see the colonel at the Visegrad Hotel, the witness saw Bosnian Serb vice president Biljana Plavsic arrive with Branimir Savovic, head of the local Serbian Democratic Party. They arrived for talks with the JNA officers. “They went into a room. I was told later that colonel could not see me and that I should come the next day,” he said. In the next few days, JNA took control of Visegrad. Later, atrocities took place across the town, with Muslims taken to its famous bridge, shot and dumped into the river. Milosevic denied that JNA had taken part in the ethnic cleansing there, saying the whole testimony was “a lie”. In its closing argument, the prosecution has called for a sentence that will ensure that Milan and Sredoje Lukic ‘will remain in prison for the rest of their lives’, a sentence that will send a clear message that there is no mercy for those capable of committing such heinous crimes. Milan Lukic’s defense contends the prosecution has failed to prove Milan Lukic’s responsibility beyond reasonable doubt, asking for his acquittal. Sredoje Lukic’s defense will deliver its closing argument tomorrow. ‘There is only one sin, and that is theft. All other sins are variations on that theme and murder could be seen as theft of life’. Prosecutor Dermot Groome used this quote from a book Kite Runner by Khaled Hosseini in his closing argument at the trial of Milan and Sredoje Lukic. Groome urged the judges to deliver the sentence that would make sure the accused ‘will spend the rest of their lives in prison’ because they ‘stole more than 3,000 years of life’ in June 1992 from the Visegrad Muslims. Milan and Sredoje Lukic are charged with setting up the two living pyres in which about 140 people were burned to death, and with the murder and abuse of Visegrad Muslims in 1992. Murder is, as Groome put it, ‘a theft of life’, not only of the victims but also of their families and the community as a whole. If the crimes at issue in this case are seen from that point of view, the prosecution noted, it will be understood ‘that the people in Visegrad suffered inestimable loss because of the actions of the two accused and the scale of the theft’. The prosecution wants the judgment handed down to Milan and Sredoje Lukic to ‘send a clear message’: all those who ‘might contemplate committing similar crimes and use vulnerable victims’ that they would be arrested and criminally prosecuted. They will have the right to a fair trial but if they proven guilty’ there will be ‘no mercy’ for them as they would ‘be punished to the maximum extent of the law’. Jason Alarid, Milan Lukic’s US lawyer, contested in his closing argument the evidence of the surviving victims and other prosecution witnesses describing them as ‘liars’, ‘lunatics’, ‘alcoholics’ and ‘hysterical persons’. Alarid challenged the identification of his client and questioned whether the living pyres in the Pionirska Street and in Bikavac actually happened. According to him, it has not been established whether there was a fire there and the victims have not been identified. In Alarid’s view, the prosecution has failed to contest the ‘irrefutable evidence on the alibi’ of Milan Lukic: therefore, all the witnesses who claimed that they saw the accused at the crime scene ‘lied’. The prosecution, Alarid contends, failed to investigate the Visegrad crimes properly and has not been able to call evidence which would prove his client’s guilt beyond reasonable doubt. 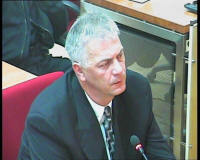 This is why, the defense counsel argued, Milan Lukic should be acquitted on all counts in the indictment. The defense of the second accused, Sredoje Lukic, will deliver its closing argument tomorrow afternoon. Before the closing arguments, the last prosecution witness, Dutch handwriting expert Wil Fagel took the stand. Fagel concluded that the signature of former police commander in Visegrad, Risto Perisic, was forged on the document corroborating Milan Lukic’s alibi for the fire in the Pionirska Street. In the cross-examination of the Dutch handwriting expert, the defense implied that Perisic intentionally signed the document differently in order to be able to deny the authenticity of his signatures later and avoid any responsibility for the crimes. In its final brief the defense contends that Milan Lukic was indicted to direct the attention away from ‘the true leaders in Visegrad in 1992’, including Risto Perisic. Today the youngest victim to be laid to rest is 6 months old and the oldest 110 years old. Bratunac Genocide victims murdered systematically in 1992 by the Republika Srpska Army. Bosniak victims carried to their final resting place by family members and relatives. The Vuk Karadzic School was a concentration camp in 1992.Bosniak civilians were beaten, humiliated and murdered. Bratunac Genocide survivor, after months in Vuk Karadzic School concentration camp. Bosniak victim showing crosses drawn on his body with a knife by Republika Srpska Army soldiers.